For some reason, it's easier to get used to total strangers reading your blog than people that you know in real life, at least for me it is. It's nerve wracking to think about people I know reading my blog because it's where a lot of thoughts lie and I'm beginning to open up more and more about personal experiences. It feels like they're seeing every thought within your mind and it's especially strange when they have already formed an impression of you. The thing is that I care what other people think. As much as I don't want to care, I do. So it gives me the chills thinking about what other people think about my blog, especially if I know them in real life, where I might see them everyday. At first, I didn't even consider telling people at my blog for a long time. I figured that I would tell them much later than I actually did. The thing was that when I first started my blog, it was just me. I didn't intend for it to be something other than an occasional hobby, in fact, I didn't even think that anyone would read it. And that was true. For a little while, at least. It wasn't until I started using social media that I people started reading it. Social media seemed a little frightening to me when I first started my blog because I was thinking, what if people that I know found my accounts online? Yes, they could obviously find my blog online too, but it's much more difficult to come across a blog rather than a social media account. You might be surfing Instagram and then come across someone that you know in your "Discover" section based on the people that you follow. It's just not the same way with blogs, which is why we bloggers care so much about SEO and self-promo. It really discouraged me to put myself out there, because I care what people think about me. I felt like if someone was to find my blog, they would judge me, look at me differently and act in a different way. So when I created an Instagram for my blog, it was like me stepping out and putting myself out there. That was the first step for me in gaining enough confidence to tell people. Readers began coming and reading my content and even commenting on it with their opinions, which also boosted my self-confidence. However, it wasn't until just recently, maybe in October, that I told my close friends about my blog. After the one year anniversary of my blog and my blog relaunch in September, I felt more pride in what I was doing and had the courage to tell a select number of friends. And they took it pretty well. One friend told me that she wasn't surprised that I had a blog, because I seemed like the kind of person that would have one. And some of my other friends told me that I shouldn't be ashamed of it, it should be something that I should be proud of, since it's definitely something extraordinary. After I told one person, it became easier and easier to tell someone new. Although I still haven't reached a level of confidence to tell more people besides my close friends about it, I'm getting there. I still hide it while having conversations, but I'm getting closer and closer to gaining the courage and confidence to start telling more people. You obviously don't have to go around telling every person you see about your blog, but it's nice to not have to hide it and be shameless about it, since it's definitely something to be proud about. The thing is that blogging is something that's incredibly unique. And although it might be natural to hide it, since it's different and people may judge you for it, it's the kind of thing that makes you special. Telling people about your blog is not an easy task, especially when you're like me and all you can think about it what other people think. But eventually, you have to come to terms with the fact that blogging is something remarkable and extraordinary. It's all about being creative, but also about creating a life that fulfills all your dreams. And maybe people might judge you if you tell them about your blog, but if they do, then they're not worth keeping around. Be proud of your blog, not ashamed of it. And eventually, it'll get easier and easier to tell people about it. The thing is that everyone's experience is different. Some people, like me, hide away and feel exposed by telling others about it. But there are others that flaunt it with pride. I asked some bloggers to give a quick little summary about their personal experiences with telling real-life friends, family, and even acquaintances about their blog. "Honestly, I told myself not to be scared to tell people about my blog because it's something to be proud of. If you have created something so personal and so creative, you should be your biggest cheerleader! I first starting telling people about my blog on social media. Most of my Instagram and Twitter friends were kids from high school and after-school activities, so they were the first ones to know. Although it was scary to put myself out there, people I had known for years showed me a lot of support. In the end, if someone doesn't like what you do, they'll unfollow you! It's not weird to create something you love and can be proud of - just remember that!" "My friends were there when I came up with the idea, so I didn't really have to tell them. I also think that a lot of people didn't totally get what blogging was or why I was doing it - since it was in 2008! I was always open and honest about blogging and I think people understood what I was doing with time. The longer I stuck with it, the more understanding people were too!" "I never really told people about my blog through my own initiative; most people found it through my social media outlets which led to different people discovering it at different times. Although I was very uncomfortable and awkward with the spread of news, eventually I grew into being more flexible with the knowledge spread of online hobby! People were surprisingly very supportive and amazed, often asking how I was able to come up with ideas, snap photos, and brainstorm content. Their fascination was a driving force in continuing blogging and would consistently bring more views to my website! It's still hard for me to initiate bringing up the fact that The Fashion Newcomer exists, but I'm slowing coming into my own with it!" So whether you're just starting out a blog or have had it for ages, telling people about your blog is something that you always come across. Of course, it's different for every person, but no matter how you tell people or who you tell, do it with confidence. Take pride in your work and be absolutely unapologetic in what you do. I couldn't relate more with what you have written! When my best friends found out about mine I was so embarrassed, and even now when they bring it up I squirm a bit. I've been growing used to it though, and I am becoming more confident about telling others, but I do care about what they think. Thanks so much for writing this post, it was very reassuring that another blogger feels the same way! I'm glad that you were able to relate to this post! As much as I would like to be more confident about blogging, it really isn't easy. I really liked this post especially the additional comments. I'm in the process of redesigning my blog and non of my friends now about it yet. I know I will get there but I think I just need to be a bit more comfortable with my own blog. It's such a daunting task to redesign your blog as well as tell people about your blog. Wishing you the best of luck with both of them! Thank you so much for including me in this post, I so appreciate it! I loved reading about your story - your blog is incredible and you should be so proud of all you've done with it! Thanks for including your experience! 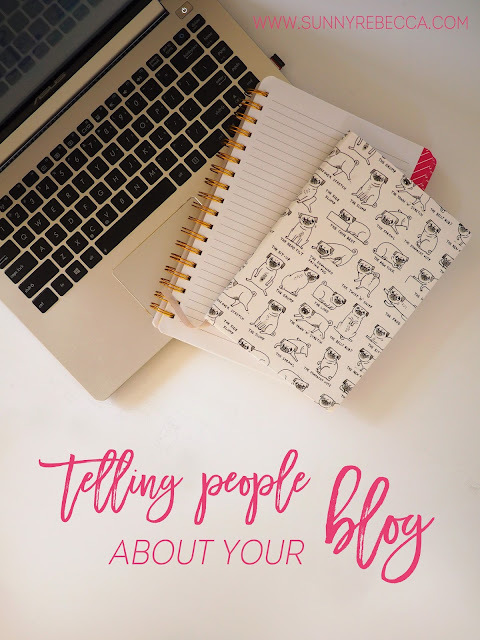 I love getting to hear stories about the blogging experience of others, because everyone's is different! Anyway, I just came across your blog today and I am super glad I did :) It seems great and I can't wait to read more of your stuff! Glad that you were able to relate and also glad to hear that you liked the post! The Bloomly is dedicated towards becoming your best self and constantly striving towards growth in life. Bloomly offers content that will help you grow, bloom, and flourish in everything that you do. Meet Rebecca, the author of Bloomly. When not blogging, you might find her baking sweet treats in the kitchen, designing handmade stationery in her room, and doing everything possible to become her best self. Bloomly is dedicated towards becoming your best self and constantly striving towards growth in life. Whether it's through enriching adventures of travel, finding confidence through style, or learning to deal with the rough stuff life throws at you, Bloomly offers content that will help you grow, bloom, and flourish in everything that you do.